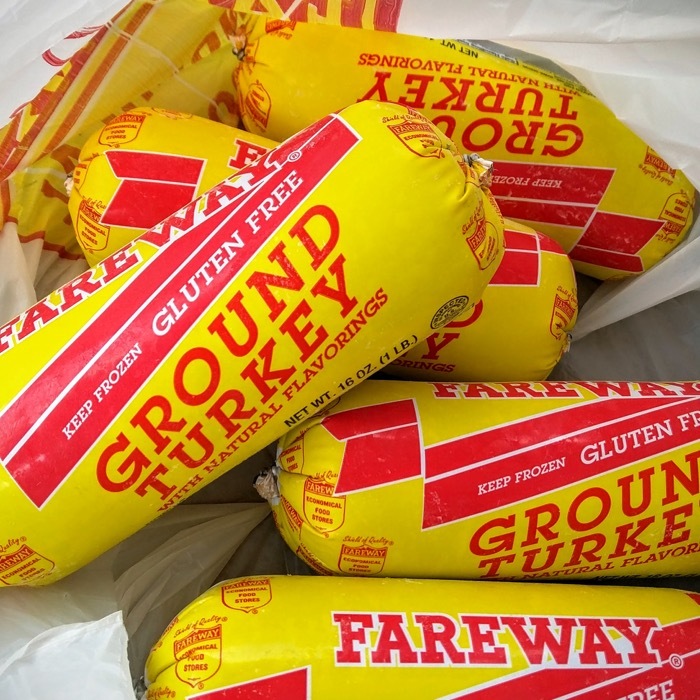 At the beginning of Summer Fareway, one of our local grocery stores, had a great deal on ground turkey. Just $1.25 a pound. I thought it was a heck of a deal and all the incentive I needed to give ground turkey a try. 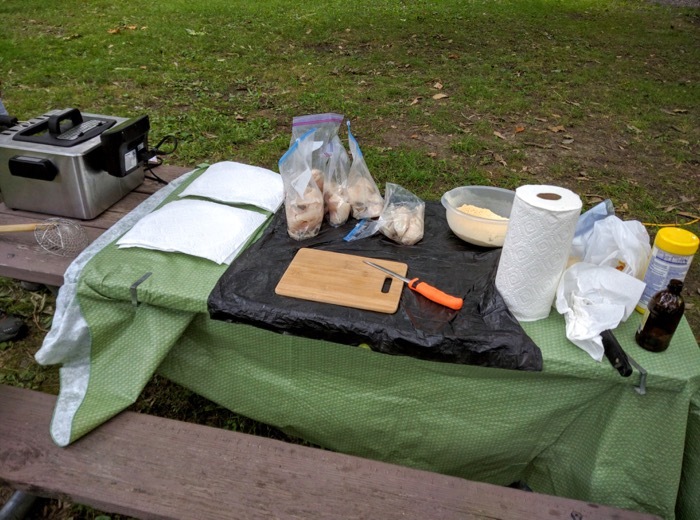 Until this Summer I’ve never used or eaten ground turkey… at least that I knew of. I picked up 10 pounds of it and my family has been experimenting with it in some of our favorite recipes. Turns out ground turkey is a great replacement for ground beef in tacos and spaghetti. I’ll be substituting it into my chili recipe later in the Fall and Winter. Since I love a good burger I wanted to see what kind of burgers we could make with ground turkey. Our first attempt was OK but a little too salty. My oldest daughter and I took that first experience, made some modifications, and came up with what we think is a pretty awesome (and economical) turkey burger recipe. We’re happy to share our recipe and a video we made below to show you how it’s done! Beat the eggs in a large mixing bowl. Stir in the soup mix and worcestershire sauce. Add the chopped mushrooms and stir to coat. Now add the ground turkey and work it all together with your hands. (Don’t forget to wash them first!) You want it all mixed together but don’t over do it. Put the mixture in the refrigerator to chill for 15-20 minutes. After the meat mixture is chilled divide into 8 portions and make each into a burger patty. Grill over medium to medium high heat for 20 – 25 minutes flipping once halfway through. When the internal temp registers 160° top each burger with a slice of swiss cheese and cook for a few more minutes. The cheese should be melty and the internal temp should be 165°. 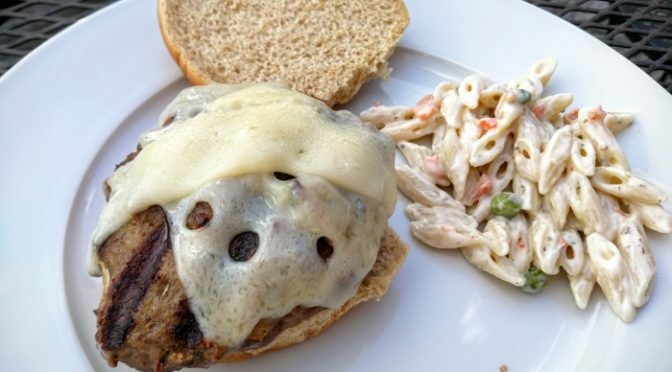 If you’ve never had or made turkey burgers before this would be a great recipe to start with. The worcestershire sauce and soup mix give it great flavor. The mushrooms add an earthy flavor and texture that help mimic a hamburger. Also, by adding the mushrooms into the burger you’re guaranteed some in every bite. When I’ve had mushroom topped burgers before many, if not most, of the mushrooms end up falling off of the burger. Since we got such a great deal on the ground turkey I figure each burger (bun, cheese, and all) cost about $1.15. Not too bad for a delicious and healthy burger! Do you like turkey burgers? How is your favorite recipe different than ours? We’re fresh off one of my favorite times of the year… our Annual Family Reunion Camping Weekend. One of my favorite things about the get-together is having a fish fry. It doesn’t happen every time, though. Only on the years when the fish are biting in Minnesota (where some relatives have Summer homes). Fortunately, the walleye were biting earlier this year and my uncle and some cousins caught enough to share with our group. My job in the fish fry is to cut the fish in manageable pieces and look for any bones that might have been missed during the filleting process. The uncle that helped catch the fish is in charge of coating the fish. It’s a not so secret breading. Just ask him and he’ll share his recipe. After they’re coated one of my cousins drops them in his fryer. 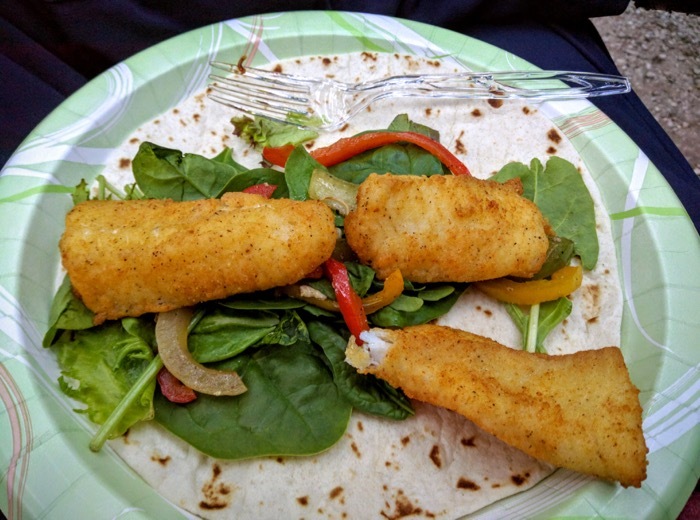 When the timer goes off and the fish are dumped on a paper towel lined plate to cool my uncle will announce, “There’s more fish ready!” It won’t take long before the plate is empty. This year, like many before, I wondered to myself if we’d have enough fish for our group. Five Ziploc bags of fish never looks like nearly enough for our large family gathering. Like always, though, we had more than enough. Everyone got their fill of delicious, crispy, fried walleye. It was better than anything you’d get in a restaurant. 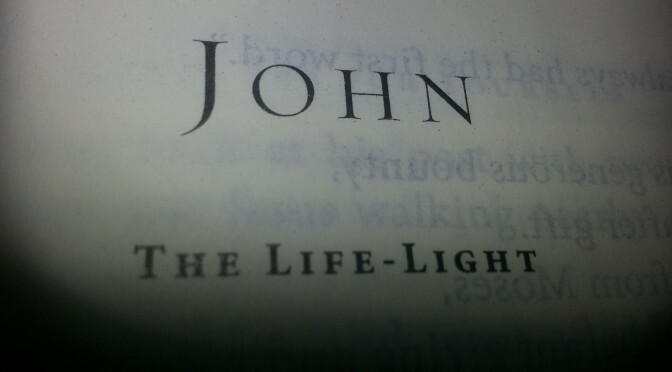 It reminded me again of the fishes and loaves story in the Bible. 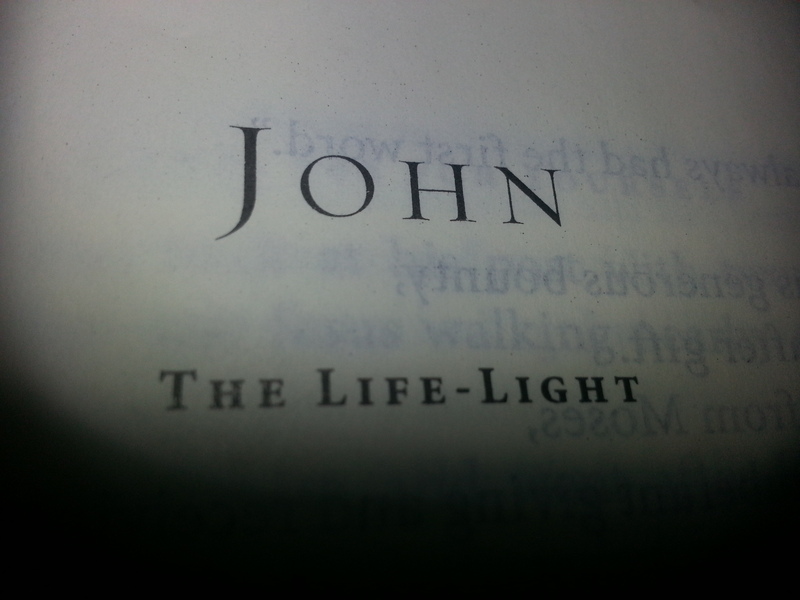 Where, like me, the disciples questioned how to feed a large group. They wondered if they’d have enough. At our fish fry, just like in the Bible, there was plenty for everyone. I chose to make a fish taco with some of my portion. It was awesome! Can’t wait until next year. Hope the fish are biting then! Since I had the fishes and loaves story on my mind I thought I’d share it with you. 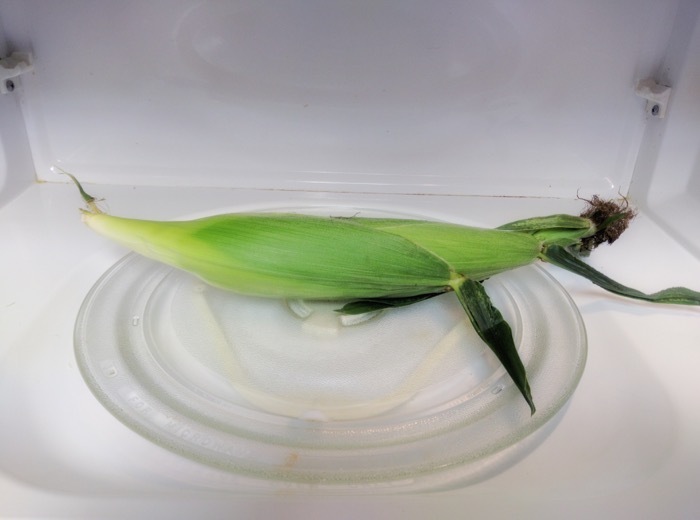 For years I’ve heard that you can microwave sweet corn and that it’s really easy to do. I’ve never had an occasion to try it, though. When we make sweet corn it’s for the whole family. Doing it an ear at a time in the microwave just doesn’t make sense. Last night the opportunity for me to try it presented itself. My wife was working late and my girls were both busy. That meant I was on my own for supper. As luck would have it, we had a few ears of freshly picked sweet corn in the house. Our neighbor, Mike, had dropped it by earlier. They had a few extra ears and wanted to share. I knew this was my chance to try microwaving sweet corn. A quick Google search gave me all the direction needed to get started. It’s really quite simple. 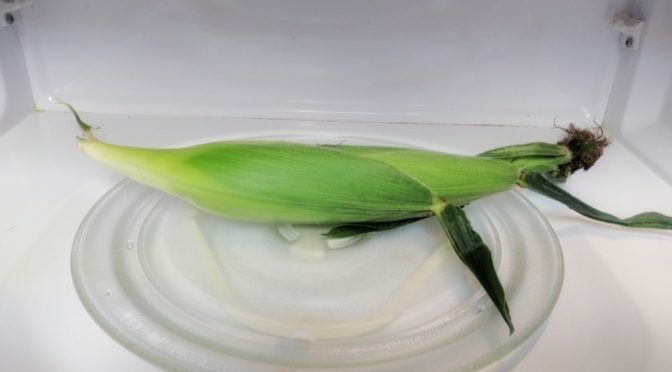 I placed one ear of unshucked sweet corn in the microwave and cooked it for 3 minutes. It got steamed right in the husk and was extremely hot. You’ll want to use some oven mitts to get it out of the microwave. Let it cool for several minutes. When it’s cool enough to handle, peel back the husks and silks, butter, salt, and enjoy! The first ear I had was good but I felt it was a little overcooked. I made a second ear and microwaved it for 2:30 and that was perfect. I’d definitely recommend this way of preparing sweetcorn if you’re just making a few ears. Any more than that and I’d stick to cooking them in boiling water for a few minutes. The hardest part of this whole process was waiting for the corn too cool! Seriously… let it cool before removing the husk and use oven mitts to get it out of the microwave. I came close to burning myself. Now I need to try cooking sweet corn on the grill and over a campfire. Have you microwaved sweet corn before?